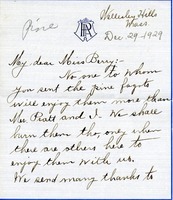 The thank you letter is to Miss Martha Berry for the pine fagots received by Ina Pratt. Pratt indicates that they will be burned when there are others to enjoy them with her. Pratt and her husband are interested in the work that Miss Berry is doing. 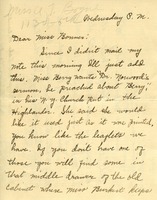 Inez writes to Miss Bonner to tell her that Miss Berry wants to put Dr. Norwood's sermon about Berry in the Southern Highlander just like it was in the printed leaflets. She also sends a list of people Miss Berry wishes pine, candy or cake sent to.